There are many different definitions of ’empathy’. We refer to empathy as the ability to step into the shoes of another; to imagine what they may be thinking and/or feeling. Empathy helps us create strong relationships and healthy communities. Does Empathy mean feeling exactly what someone else feels? No it doesn’t. We can never know exactly what another person is feeling, or be able to exactly replicate those feelings, but we can make an attempt or an estimation. Empathy Week is a seven-day festival of events which promote empathy, human connection and the recognition of our shared humanity. Empathy Week is curated by Humainologie and is a community initiative with numerous Calgary partner organizations and individuals coming together to host a variety of events. Are Empathy Week events free? Most events are free and low income subsidies for events with an entry fee can be requested by contacting hello@humainologie.com. Is Empathy Week for everyone? Empathy Week includes varied programming suitable for diverse audiences with wide-ranging interests. The diversity of programming will continue to grow as our festival does in the future. Should you wish to attend an event but would like to enquire about accessibility – whether connected to physical access, translation or for the hard of hearing – please contact us at hello@humainologie.com to make a request to accommodate. We cannot guarantee the ability to do so in all cases however. Is there an Empathy Week in my city? As far as we are aware, Calgary is the first city in the world to host an Empathy Week. Contact us to find out how to establish your own event. Can I volunteer for Empathy Week? How can I be involved in Empathy Week 2019? 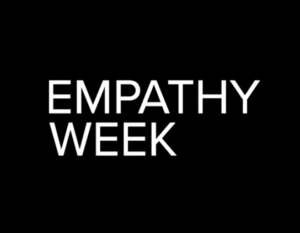 Empathy Week 2019 will take place June 1-7 in Calgary. A Request for Proposals has been issued to invite community collaborators to take part in hosting events for Empathy Week. Who was involved in Empathy Week 2018?